Nitin Sharma leads Product Partnerships with strategic partners for Google in India. He works with partners across News, Media, Entertainment and Telco to help them understand how to leverage Google’s advanced product features across Search, Assistant, Web, Google News, Maps and Tenor. He also works extensively with the Google product and engineering teams to develop solutions to meet the needs of Indian users. In previous roles at Google, Nitin led publisher sales and Ad monetization partnerships and the rollout of enhanced video solutions for Broadcasters in India. He has 14+ years of business development and sales experience. 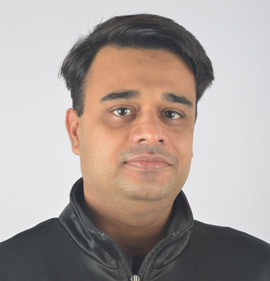 Prior to joining Google in 2015, Nitin was managing OEM relationships and leading New Business Development at Adobe, where he launched new products and led strategy projects. He has also worked in corporate strategy and software consulting roles with Dell and Tata Consultancy Services. Nitin received a B.Tech. in Computer Science and MBA from FMS, University of Delhi.